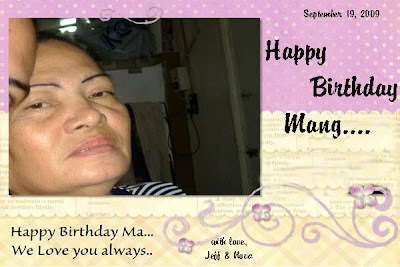 To my everdearest mother, who is celebrating her birthday today in Philippines with the rest of my family and relatives. I would like to express my gratitude of being your daughter. Because if not with you, I would never be wherever and whatever I am now. Which I am very thankful of. May God Bless you always and shower you more blessings and good health longer with papa. Love you so much. And I really miss you around.